The ArtPrize Nine FAMILY Experience Guide offers two stroller-friendly routes through the event -- one perfect for young children with lots of parks and open spaces to pause and play, and one great for older kids with interactive art to encourage discussion and critical thinking for creative minds. Find the ArtPrize Nine Family Experience Guide online at GRKids.com. There you'll also find a list of recommended artwork to see at venues along the way. La guía está disponible en español. ArtPrize HUBs are a great place to start your ArtPrize adventure. Stop by any HUB location where a friendly volunteer can make sure you’re ready to vote for your favorite entries, help you map your unique ArtPrize route, equip you with one of our new Experience Guides (like the Family Experience Guide!) and an enhanced Metro Pass, give you your free ArtPrize Event Guide and help you make the most of your ArtPrize experience. Check out ArtPrize HUB locations below, and be sure to watch out for our new Mobile HUB at ArtPrize events and hotspots throughout the 19-day event. And don't miss the ArtPrize HUB/HQ presented by Steelcase, where you'll find the beautiful Pop Up Park, the STEAM Village, an ArtPrize Labs Studio, and our flagship retail store. Art is for EVERYONE. If enjoying art is new to you, or you're a seasoned art expert, watch this video for simple steps that can help everyone connect, converse and learn. Art is meant to be experienced, but it's also fun to make! Unleash your creative spirit with activities designed for artists of all ages. Stop by one of our ArtPrize Labs Studios to create your own work of art, and keep an eye out for our Mobile Workshop unfolding fun times at a different location each day. Stop by the STEAM Village to experience the power of art and creativity, combined with science, technology, engineering and math. And don't miss our Partner Programs, produced by leading arts and cultural organizations. Check out "Events for Families" below for details! 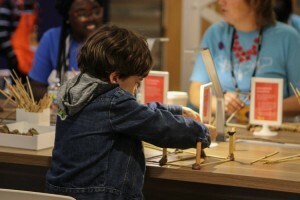 ArtPrize Labs is sponsored by Grand Valley State University, Herman Miller Cares, and Switch. The STEAM Village is powered by Switch. Find more fun activities for kids and families on our Event page. Looking for artwork your kids will enjoy? The Famly Experience Guide is a great place to start, with venues selected specifically because they're showing work we think your whole family will love. If you're still in search of more to see, head to our Find Art page to create a List of your own! At ArtPrize, your voice counts! If you're 13 or older, you can cast votes in support of your favorite artworks. And for the first time ever, you can vote for artwork created by youth collaboratives. The entries eligible for the Youth Collaboration Award, sponsored by the Western Michigan University, are marked on the Family Experience Guide map. Vote using the ArtPrize mobile app -- free for iOS and Android -- or visit any ArtPrize HUB. 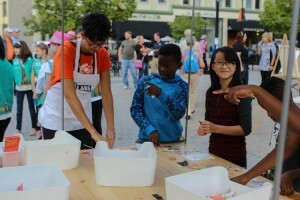 Everyone can have a blast at ArtPrize - no minimum age required! Our friends at GRKids.com have compiled a very helpful list of tips and tricks that West Michigan moms and dads recommend for getting most out of the annual event. Check out the list on their website: Insider ArtPrize Tips for Families.